On October 21, 2016, Friday, the Knights men’s swimming and diving team won four different events at the MIAA relay held at Holland, Michigan. 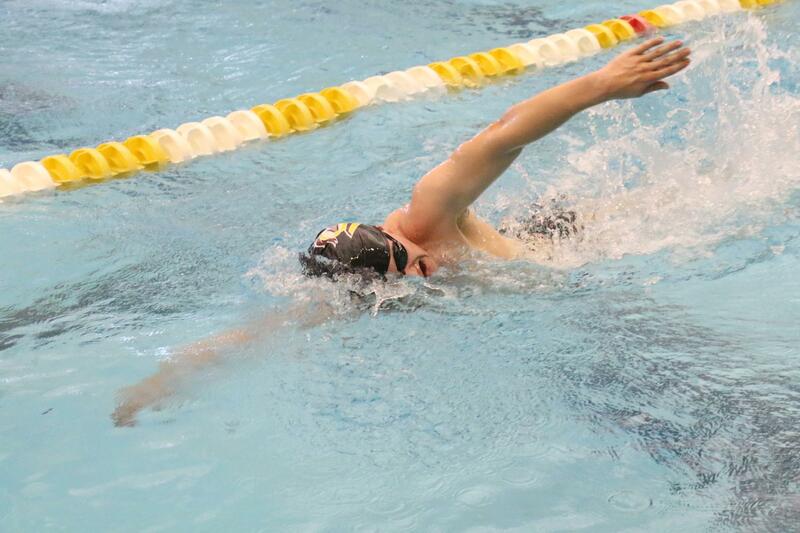 The Knights began by winning the 200-yard medley relay, with a record of 1:35.21. Calvin’s team that competed in this relay consisted of sophomore Ben Holstege, senior Eli Holstege, senior Brett Stoughton and sophomore Jared Britton. With a record of 1:51.56, the Knights secured first place in the 200-yard breast relay. This time the team consisted of first-year student Fear Churchwell, Eli Holstege, first-year student Sam Holstege and sophomore Jacob Lensing. Calvin took first place in yet another event, this time in the 3×500-yard medley relay, with a record of 15:15.81. The winning team consisted of Fear Churchwell, first-year student Brian Goins and sophomore Nathan Olberding. Finally, Calvin finished first in the 400-yard medley relay with a time of 3:43.29. The final team consisted of Ben Holstege, junior Skyler Fish, Fear Churchwell and Brett Stoughton. Chimes sat down with Ben Holstege, a freshman from Keswick, Virginia. Q: How do you feel after winning four different relays? Are you proud of your performance, or do you think the team could have done better? A: Winning four relays was an accomplishment. This was the first meet of the year, and you never know how the new team will compete together. All in all, it was a great success, both on the men and women’s side. If we had reorganized some of our relays we could have certainly won more than the four, but winning wasn’t what this meet was about—it was in fact an unscored meet—it was about shaking off the rust and getting in the competition mindset for the rest of the season. Q: What goals do you have, short-term and long-term? A: Short-term goals would be to continue to move the team forward, meet by meet, toward invite. That means focusing in practice and giving the right type of effort in meets. Long-term goals would include attaining a 4th consecutive conference championship, along with bringing a team to nationals that is prepared to compete with some of the bigger name teams out there like Kenyon and Dennison. Q: How did you start swimming? A: I started swimming on a swim team at age 5 because my parents wanted me to learn how to swim, and the local swim team was the most economical way to do that. Then, at one of our meets as kids, a coach saw Eli swimming and was impressed. He talked to my mom about signing him up for year round competition, and I got dragged along. The rest is history! Q: How many hours do you practice swimming? A: We practice for about 2 hours a session 8 times a week, including lifting and dryland and competition. Q: How do you feel about the loss to GSVU this past Saturday? A: GVSU is a powerhouse division 2 team. A loss to them numerically isn’t really a loss for the team. We get see what it’s like to compete against some amazing athletes very early in the year, and it gives us the opportunity to compete against a team that is better than us, something we don’t always get to do in conference dual meets. This type of meet, being the underdog and all, is great for the competition mindset and prepares athletes for bigger fields of competition like conference championships and nationals. Q: How do you feel about the upcoming meet at Olivet this Saturday? Worried? Confident? A: I’m very confident about the Olivet meet, both individually and team wise. We are a much stronger team, and it should be another great opportunity to get some fast swims in and continue our growth as a new team.